Certified organic strawberries from Village Acres Farm. They really are as good as they look. Join us this Friday from 5pm-6pm to celebrate our two year anniversary! Like every Friday evening, we’ll be pouring wine — but this Friday, it’ll be bubbly. 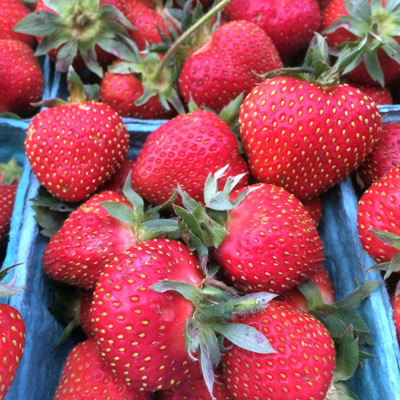 Strawberries will be here “for real” this week! Still some asparagus, too, though we’re likely reaching the tail end of it. And cucumbers and garlic scapes make their debut! This week last year I wrote what has turned out to be one of our most-read blog posts, about our first year in business. Last year I wrote, “I can’t believe it’s been that long, and I can’t believe there was ever a time when we weren’t doing this.” I still feel that way, and this year I add a disbelief at how far both the Market as a whole and R&R have come over the past year. A year ago, Dusty and I were just starting to believe that R&R could turn out to be a real, viable business — that it could be something we could make a living at. We were very excited that it was starting to look possible that we had (sort of accidentally) managed to turn our personal local food hobby and passion into a business that could sustain us. We were adapting to the extra time the stand took up beyond what we originally thought we’d need to devote to it, and just starting to realize that we couldn’t do it alone. A year later, we have three employees (the wonderful Tyler, Becca, and Veronica, who many of you know now), with at least one of them scheduled for almost every minute the Market’s open. We find ourselves thinking less about, “How can we attract more customers?” (though of course we always love more customers!) and more about, “How can we meet this demand?” As the stand (and Market) continue to grow, we find that we are continually facing new challenges. Right now, it feels like our biggest challenges are space and time. Pretty basic, right? There are pressures from two sides — on one side, it seems that the longer we’re around and the more people hear about what we’re doing, the more we hear from local farmers and producers about wonderful products they’re growing or making that they think would be a good fit on R&R’s metaphorical shelves. More often than not, we agree with them — but have trouble finding the actual shelf space (or freezer space) to fit them in. And on the other side, we have the folks who would like to actually buy those products and take them home with them, but find that either the Market isn’t open when they would like to be shopping, or the Market is jam-packed full of people doing the same when they do come. I’m sorry to say, we don’t have anything to announce today. We are, however, continuing to work on it. But, while we are making progress, I don’t expect that we’ll have any big announcements right around the corner. It could even be another year before anything worthy of an announcement is on the immediate horizon. But as we hear more and more of you say to us, “I wish you were open more days,” or, “I wish you carried –” we want you to know that we hear you. We want it, too. It will happen; it is happening. Last year I wrote, “We are deeply grateful to live in a time and a place where there is a demand for real food, good food, local food; and we’re deeply grateful to be a link in its supply.” This is more true every weekend, every day. My favorite part of what we’re doing is the relationships — with our local farmers and producers, and with you, our customers and friends. Thank you for being here with us — for two years now! — and I hope you’ll join us this Friday from 5pm to 6pm to celebrate.